"In the ever-changing world of technology choices – Full Sail Partners offers the stability of Deltek Vision, and a history of successful implementations that will allow you to spend your time and resources on what’s important to you – your clients!" Ashley Jabalera is a CRM Consultant with Full Sail Partners. 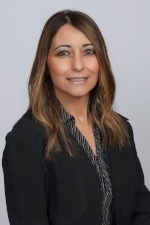 She has over 17 years of experience in the A/E/C industry with an extensive background in business development and leadership within an extremely competitive and product based service environments. Her work history includes the procurement of projects ranging from 10 million to over 1 billion dollars, with a focus on healthcare, commercial, retail, industrial, higher education, government and military clients. Ashley is a very driven individual who sets high standards. Ashley holds a B.S. degree in Business and Mass Communications from Regis University in Denver. Additionally, she served a 3-year term on the board of directors for the Rocky Mountain MS Center, University Hospital Fitzsimmons. She has also been involved in many organizations including NAIOP, DBIA, BOMA, AIA, and USGBC. Empower. We empower our clients with the training and support to confidently utilize Deltek Vision to its fullest extent. This enables you to track and report on valuable information, and provides the knowledge to enhance and streamline internal processes.